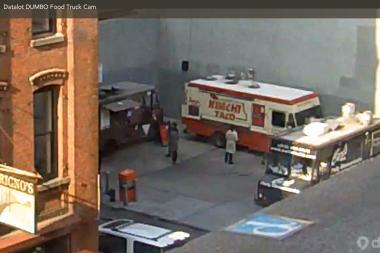 DUMBO food truck cam has a bird's eye view of the happenings at the food truck lot. DUMBO — Smile! You're on DUMBO food truck cam. DUMBO tech company Datalot set up a live webcam from the ledge of their third story window at 65 Jay St. that looks directly on DUMBO's food truck lot giving workers a bird's eye view of available lunch options and line lengths. "Instead of rushing down there to see how long the lines are we can check the webcam," said Datalot office manager, Alexis Ching. The webcam stream received more than 1,000 views on its first day — and has only grown more popular as people in the neighborhood find out about it. Josh Reznick, Datalot CEO, came up with the idea after watching coworkers make trips to the window overlooking the lot to decide whether to venture downstairs for a bite. "We just moved into this new space and immediately noticed that everyone in our office was constantly walking into the conference room to check out the view of the food trucks," Reznick said. "I know I would often give up on a food truck if the line looked too long," he added. Reznick thought a webcam would help and might also help food truck operators manage the lunctime crowds. "The hope is that allowing people to see what the wait looks like will help to more evenly distribute traffic flow over the course of lunchtime." In a neighborhood that depends on food trucks for lunch, workers at other companies quickly jumped on the webcam bandwagon. "Revolutionizing lunch in DUMBO one live stream at a time," tweeted RedAntler, a DUMBO branding firm while Kate Falanga who works at DUMBO-based digital design agency Huge Inc. tweeted, "Datalot you deserve a community medal or something for this, thank you!"